Hats With Attitude are knit'n'felt hats. They are first hand knitted with sheep's wool from Iceland. Then they are shrunk in the washing machine and turned into felt. After a dip into ice-cold Chugiak water they are placed on forms to dry. Last but not least, they are embellished, labeled and named. These original hat designs range from the Roaring Twenties bob hats, through the Fifties cowboy hats, up through today's fedora. Alaskan women know it takes more than studs to make it through the winter. It takes attitude. We keep it under our hats. 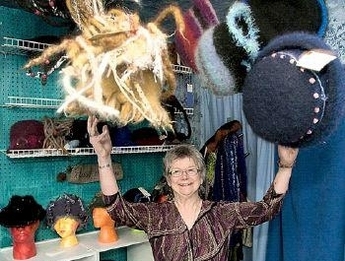 The Hat Lady says, CELEBRATE!! 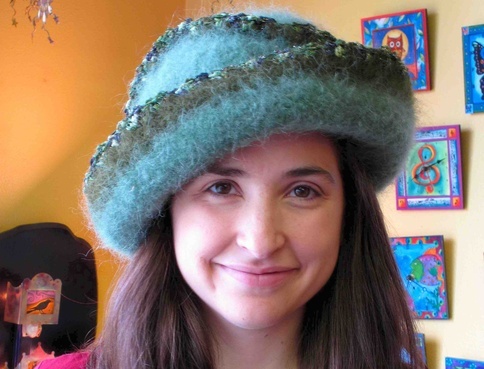 Felt hats are warm in cold weather, dry in wet weather and look fine. There is a Hat With Attitude for every size head. And, yes, that includes both pin-heads and pumpkin-heads. This website enables you to purchase a hat already made. Or, you might decide to choose a stye and color and commision the Hat Lady to make your hat.